Thought the social element of gambling was lost to online casinos? Think again. Guts Casino’s new live dealer Blackjack Party takes social to a whole new level, with two chatty croupiers in charge of a hole-card game of blackjack, dealing cards to you and other players, as you place real money wagers among an atmosphere reminiscent of Saturday night at a land based casino. Blackjack Party, a product powered by Evolution Gaming, is a new format of live dealer blackjack featuring two lively dealers who make it their job to keep things entertaining, while you enjoy a real money game of the American version of 21 (dealer checks for blackjack). 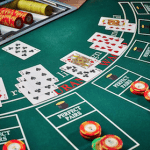 Once you’ve registered an account at an online casino that offers this fun blackjack variant, you’ll be able to venture to the live casino section and enter the Blackjack Party. Note: live croupier titles can only be played for real money, so you’ll need to make a deposit before being able to place any wagers within this game. You can watch for free without placing any bets, but after a certain amount of time being inactive, you’ll be returned to the live games menu. Take a virtual seat at the table, and engage with the croupiers via a high definition live video feed, streamed directly to your computer, tablet or Smart TV. The betting table interface is exactly like any other blackjack table, with the option to place a traditional blackjack wager, bet behind other players, place a perfect pairs side bet and a 21 + 3 side wager, too. Blackjack Party rules: – The dealer stands on all 17s, eight decks are used, blackjack pays 3:2, you can double down on any two initial cards and you can split your hand only once. Minimum blackjack bet is $5 and maximum wager is $1000 (bet behind limits are $0.50 to $100, and the two other side bet betting limits are $1 to $250). Once seated, you’ll be asked to place your desired bet, and among the six other players, you’ll take it in turns (your right to left) to make your own decision on how to play out your hand. The croupier in charge will gesture to you when it is your turn to make a move, and you’ll also be notified with an early-desicion option. With party music playing in the background and the chatty croupiers engaging in some light-hearted banter and fun, make your voice heard with the chat feature and get the dealers to respond directly to your questions and opinions. Keep it clean, as inappropriate language and comments can lead to ejection from the game (just like in a brick and mortar casino). This wager is most commonly found in Las Vegas casinos, so most players rarely have access to this entertaining blackjack side bet. Bet Behind – An option often not allowed in Vegas casinos, but quite prevalent in other countries, players can bet on another player’s hand (often used if a player is on a hot winning streak). You can place this type of wager even if you are watching over the game and not actually seated, but you can’t bet behind your own hand. Whomever you have bet behind, it is he/she who remains in control of the hand and decides whether to hit or stand. However if insurance is offered, you can decide whether you wish to take it we advise never taking insurance), and you can also decide whether or not you wish to split if the option arises, and the player in charge chooses to do so. The ‘hot players’ icon helps to determine who of your fellow blackjack players is on the longest winning streak. 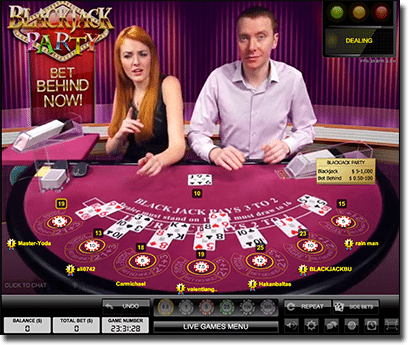 Blackjack Party keeps all traditional options open to the player, such as view change (3D or classic), being able to hide or show the chat feature, change the video quality, check statistics and history of hands, set up an auto-play function, play in full screen mode and a heap of other customisable settings. 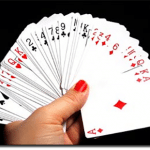 With the intention to keep gambling fun and enjoyable, Blackjack Party ticks all the boxes – the croupiers are there to liven up the environment, create a light-hearted and jovial ambience, and the back and forth chat with them (always one guy and one gal) is always of great entertainment value. Sign up at www.Guts.com, receive a $300 welcome package, and indulge in this social game of live dealer blackjack to lighten the mood.